My answer: I have to deal with the fact that the standard Greek texts of 1 Timothy 3:1–13 have no masculine pronouns because most translations insert them into the text, and English readers incorrectly assume that there are corresponding masculine pronouns in the underlying Greek text, when there are not. Furthermore, there is no dispute that 1 Tim 5:3-16 is dealing specifically with women. Widows are repeatedly identified as the subject (5:3, 4, 5, 9, 16). 5:3 has a feminine article. 5:5 has a feminine participle, which, like the following feminine participles, identifies the subject as female. 5:6 has a feminine article and two feminine participles. 5:9 has a feminine participle that makes it unambiguous that “one-man woman” (ἑνὸς ἀνδρὸς γυνή) specifically describes a woman. 5:10 has a feminine participle. The comparative adjective in 5:11 is feminine. 5:12 has a feminine participle. 5:13 has two feminine participles. 5:14 has a pronominal adjective identifying the subject to be younger women. 5:16 has a feminine pronoun and is part of this section on widows, so it is not correct to say that there are no feminine pronouns in this passage discussing the role of widows. 5:16 also has a feminine article with “widows.” Each of these factors and the standard use of χήρα to identify female widows [“χήρα, -ας, ἡ fem. of χῆρος = bereft (of one’s spouse)” BAG 889] make it clear that Paul is not talking about men who have lost their wives as widows. My answer: The subject of 1 Tim 5:9 is the feminine χήρα, which, apparently without exception in Greek literature refers only to women. Furthermore, 5:9 has a feminine participle that makes it unambiguous that the one-man woman specifically describes a woman. There is no corresponding element in the context of 1 Tim 3:2 that makes it unambiguous that “one-woman man” (μιᾶς γυναικὸς ἄνδρα) specifically describes a man. 1 Tim 3:1 specifically states that “whoever [τις, the same word used of widows in 1 Tim 5:4] desires the office of overseer desires a good work.” Paul clearly intends this to encourage people to desire this good work. Is it likely Paul would identify the subject as “whoever” and encourage them to desire this good work if for women it was forbidden fruit? Two of the most prominent complementarians acknowledge this phrase does not clearly exclude women. Douglas Moo acknowledges that this phrase need not exclude “unmarried men or females from the office … it would be going too far to argue that the phrase clearly excludes women….” Douglas J. Moo, “The Interpretation of 1 Timothy 2:11–15: A Rejoinder,” TJ 2 NS (1981): 198–222, 211. 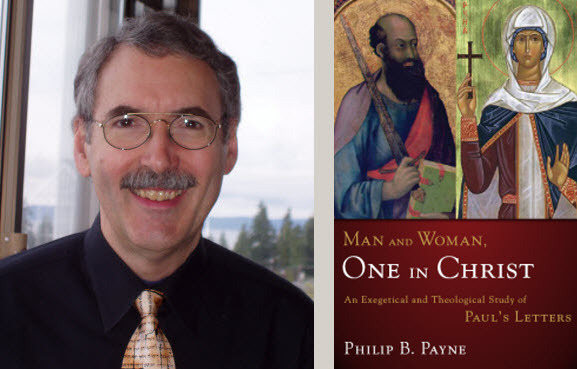 Thomas Schreiner acknowledges, “The requirements for elders in 1 Tim 3:1–7 and Titus 1:6–9, including the statement that they are to be one-woman men, does not necessarily in and of itself preclude women from serving as elders….” Thomas R. Schreiner’s “Philip Payne on Familiar Ground: A Review of Philip B. Payne, Man and Woman, One in Christ: An Exegetical and Theological Study of Paul’s Letters.” JBMW (Spring 2010): 33–46, 35. In any event, there is a general consensus that 1 Tim 3:2 is an exclusionary phrase. It excludes from the office of overseer those who are not monogamous (and probably those who are not living in sexual fidelity). It is generally agreed that it is not a requirement that all overseers must be married. Otherwise Paul and Christ could not be overseers, and Christ is the only person named in the NT as an overseer (ἐπίσκοπος). Indeed, if being a “one-woman man” is a requirement rather than an exclusion, virtually the entire Catholic priesthood would be excluded. If this were an exclusion, even if it were to be proven to be exclusively male in reference, it would not exclude women from being overseers. It would simply exclude men who are not “one-women men” from being overseers. My comment: It is, indeed, misleading when a version assures its readers that it will or will not do something and then does the opposite. The ESV makes many such assurances that it repeatedly breaks when the Greek text, but not its English translation, supports the leadership of women in the church. My forthcoming review of the ESV Study Bible identifies in many specific instances of this. We desperately need a more accurate translation of the Greek of Paul’s passages about the ministry of women. One of the goals of my book is to identify for non-specialists where various translations have not fairly represented the Greek and to provide solid evidence for a natural reading of these crucial texts in God’s Word. My answer: 1 Timothy 5:3 states, “Honor widows who are real widows.” “Honor” in this verse refers to financial support, as is evident in the contrast in v. 4 regarding widows who have children or grandchildren who can support them (cf. vv. 8 and 16, regarding the obligation to provide financial support to one’s widowed relatives) and the statement in v. 5 that by “real widows” Paul refers to widows who are “left all alone.” In Paul’s day, most women were dependent on their families for financial support. Widows without supporting relatives lacked means of financial support in a way that widowers did not. Consequently Paul made these provision for widows and not for widowers, who could work outside the home and as a group did not have nearly the need for support as widows. Hello Philip. Could you comment on the possibility that ‘one woman man’ is an idiom somewhat like ‘one horse town’ or ‘one trick pony’, such that the individual components of the phrase need not be taken literally, but the entire phrase stands for a concept (i.e. fidelity)? Thank you for this thoughtful question. “One woman man” does appear to fit Webster’s Dictionary’s definition of an idiom: “a phrase, construction, or expression that is recognized as a unit in the usage of a given language and either differs from the usual syntactic patterns or has a meaning that differs from the literal meaning of its parts taken together.” “One woman man” is certainly a phrase that must be recognized as a unit in each of its NT occurrences. It also differs from usual syntactic patterns in conjoining nouns without explaining their interrelationship. Chrysostom’s Homily on 1 Tim 3:2 states, “This he does not lay down as a rule, as if he [an overseer] must not be without one [a wife], but as prohibiting his having more than one.” NPNF1 13:438. In context “one woman man” clearly excludes polygamy and by logical extension may also exclude sexual infidelity. The closest English expression is “monogamous.” Webster’s Dictionary defines monogamy as “the practice or state of being married to only one person at a time.” Even though its component parts “one woman” might be interpreted as gender specific, it is normally used to describe both men and women. Such usage is common in Greek, where by convention groups including both men and women are generally referred to in the masculine gender. Only when no men are included is it conventional to use feminine forms in Greek. Thus, for instance, 1 Tim 5:9, speaking exclusively of the enrolling of widows lists the requirement “one man woman.” This is the corresponding idiomatic expression specifically used to address only women who are monogamous. Thank you so much for this information. I have quoted you in a blog-article entitled “Paul’s (gender-inclusive) Qualifications for Church Leaders”. Sorry for coming late to this discussion. I hope it’s still possible to ask questions. I found this article very enlightening. One thing I am wondering: if 1 Tim. 3:1-13 is gender inclusive, why specifically mention women in verse 11? And are these women more likely to be women ministers or wives of ministers? The reason Paul specifically mentions women in the category of deacons is that he wants to make it clear that women can be deacons and that their qualifications parallel those of men. Then, you may ask, why didn’t Paul state requirements for women overseers as he did for women deacons in 3:11? It is clear from 1 Tim 2:12-15 that Paul was concerned enough about the false teachers’ deception of women in Ephesus that he prohibited the women in Ephesus who did not have recognized teaching authority from assuming authority to teach men. He probably did not want to encourage deceived women to become overseers prematurely because of the false teachers’ influence on them and because of the spiritual influence overseers have through teaching, evident in “able to teach” (1 Tim 3:2). If he had included a list of requirements for women overseers as he did for deacons in 3:11, he would have provided a specific mechanism for women to attain a position of authority from which they could promote false teaching. If he had provided such a list specifically for women overseers, deceived women might have used that list as a basis for demanding the office of overseer, from which they could spread false teachings. Your second question raises an important enough point that I will make it a separate post, hopefully to go up today. You write, “Are these women more likely to be women ministers or wives of ministers?” Your second question may reveal why you asked the first question and may suggest the very answer I just provided. Perhaps it was because you thought of both sets of qualifications as referring to essentially the same position, “ministers,” that the different character of the two offices described here did not suggest to you the reason for women to be specifically identified only with the second office, “deacon.” “Ministers” in English probably conveys to most people more the idea of “overseer” or “teaching elder” than “deacon.” The word “overseer” does not occur as early as when Romans was written, so “Phoebe, deacon of the church of Cenchrea” had what was, as far as we know, the highest title of a local church leader at that time. Hi, Dr. Payne. I’ve just ordered your book and am looking forward to reading it. Forgive me if you answer this in the book… Also let me say at the outset I don’t know Greek, either, so I’m trying to understand your points as best I can. In looking at 1 Timothy 3:1-7 at biblos (http://biblos.com/1_timothy/3-2.htm), there are quite a few masculine articles, participles, nouns and adjectives. In 3:2 in particular, “overseer” is a masculine noun preceded by a masculine article. Why does that not indicate that a man is envisioned? I notice that in 3:1, the term “overseer” is feminine noun. Is that why you argue that it is unclear…because by using a feminine noun the first sentence, and masculine in the next, Paul is indicating it’s open to either? If so, what about the use of masculine participles, articles and adjectives used throughout the rest of the passage? Were there not neuter versions that could have been used? Or is that not how Greek works? Again I’m sorry for the rudimentary/Kione 101 type question. I’m just very interested in understanding. Thanks again! Hi, Robert! Thanks for explaining that you do not know Greek. I’ll try to make this simple. In Greek, words are assigned a gender, but their “gender” is not about biological gender. So the word for the office of overseer to be feminine does not mean that it is a feminine office or appropriate for women but not men. Hi, Phil, great discussion! I have a comment on your last reply, then a question. Further evidence that Phoebe was indeed a church leader is found in the the Syriac translation of the N.T. where the word for “deacon” is translated “shammash.” This was the designation used for the “president” of the synagogue. I am in agreement with your position that 1 Tim 3:2 is referring to marital fidelity as a qualification for leadership, and that the phrase is probably an idiom. My question is twofold: First, is there any known ancient Greek literary usage of this phrase where faithfulness to one’s spouse is clearly in view? Second, understanding the idea that 1st century Greeks would have understood their own language and idiom, how is it that the ancient Greek Church took the position that it did, namely that multiple or consecutive marriages disqualified one from church leadership? How is it that they did not understand the phrase to refer to faithfulness instead? Thanks! In fact, many church fathers identify it, instead, as referring to polygamy or bigamy, including Chrysostom, Theodore of Mopsuestia, Theodoret, Theophylact, Oecumenius, and Jerome. The primary influence on the “no remarriage” interpretation seems to have been from asceticism. As far as I know, the earliest reference to the view that it prohibits any remarriage is Clement of Alexandria, Stromata 3.12. The Stromata are dated 198-203, so this is a full century after the first century. Next, I believe, is Origen, Hom. in Lucam xvii, p. 953, writing in the mid 200s. He is known for his ascetic views. Eusebius writes that Origen castrated himself. His asceticism may have influenced his objecion to any remarriage by overseers. Other works interpreting “husband of one wife as excluding remarriage are later and likely influenced by asceticism, which had a powerful influence in the church during these times. The Apostolic Church Order is 3rd century. The Apostolic Constitutuions vi.17 is ca. AD 375-380. The Canons of the Apostles 16 (17) is ca. 400. The Testamentum Domini is 5th century. As I explained this passage, the subjects of verse 10 and verse 11 are not the same. In verse 10, the subject is all deacons. In verse 11, the subject is a subset of that group, namely “women” deacons. There is, however, nothing in this adverb, nor its description in the DBAG NT Lexicon, that requires a change of subject as you seem to imply. For example, the subject referred to by this adverb in both 1 Cor 11:25 Luke 22:20 is the same as its corresponding clauses in 1 Cor 11:24 and Luke 22:19, namely Jesus, who instituted both the bread and the cup to be taken “in remembrance of me.” Note that the form of the Lord’s Supper tradition known to Paul was the form expressed by his close companion, Luke. Similarly, after affirming “the firstfruits of the Spirit” in Rom 8:23, Paul states in v. 26, “Likewise the Spirit helps us in our weakness.” Here, too, there is no change of subject. Nor is there a change of subject with this adverb in Matt 20:5; 21:30 or 21:36. Here, as in each of Paul’s uses of this adverb, it highlights something similar. In this case, it is the requirements for the office that are virtually identical for women (all four in the same order) as they are for all deacons. Mark 14:31 and Luke 20:31 are similar to 1 Tim 3:11 in having this adverb connect clauses where the subject of one clause is a subset of the subject of the other. These examples demonstrate that one should not conclude from the specific reference to “similarly women” in v. 11 that women must not have been part of the group of deacons in v. 10. Please note that Paul commonly duplicates content for a specific purpose. In 1 Corinthians 7, Paul reiterates in identical wording statements regarding husband and wife ten times: in verses 2, 3, 4, 10-11, 12-13, 14, 16, 28, 32 and 34b, and 33-34a and 34c. The effect of this voluminous repetition is to emphasize that wife and husband have equal rights and responsibilities in these ten matters regarding marriage. As far as I know, 1 Corinthians 7 is the broadest affirmation of the equal rights and responsibilities of husband and wife in all of Greek literature. Similarly, the repetition of nearly identical requirements for deacons in general and women deacons specifically emphasizes that women must all meet the same qualifications. Making clear that these requirements also apply to women was important practically in the church in Ephesus Paul is writing to Timothy about. Chapter 5 tells us that some younger widows had already followed after Satan and were “going about from house to house” (house church to house church?) “saying things they ought not.” It was important both to keep unqualified women out of church leadership and to affirm qualified women leaders, like Prisca, who would be in the best position to correct the women deceived by false teachings. After all, Acts 18:26 lists her name before her husband’s name, contrary to Greek custom, for “instructing Apollos in the way of the Lord more accurately.” She was probably in Ephesus when Paul wrote 1 Timothy since Paul greets her in 2 Timothy 4:19.